A ListBox is a vertical container that contains ListBoxRow children. Using ListBox is often an alternative to TreeView, especially when the list contents have a more complicated layout than what is allowed by a CellRenderer, or when the contents are interactive (e.g. contain a button). Although a ListBox must have only ListBoxRow children you can add any kind of widget to it via Container::add(), and a ListBoxRow widget will automatically be inserted between the list and the widget. 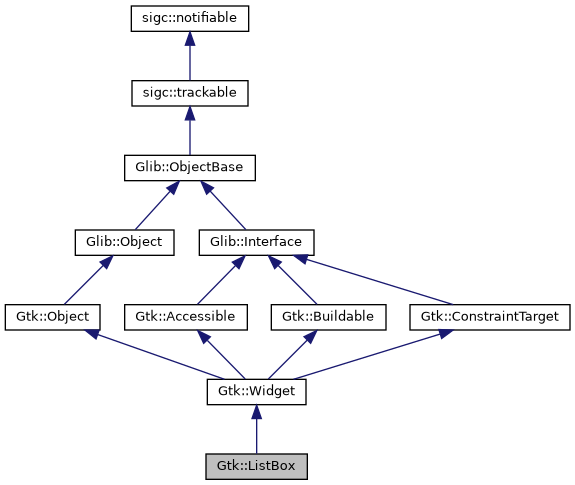 For instance: Gtk::Widget* on_create_widget(const Glib::RefPtr<T_item>& item);. Called for list boxes that are bound to a Gio::ListModel with bind_model() or bind_list_store() for each item that gets added to the model. Versions of GTK+ prior to 3.18 called show_all() on the rows created by the SlotCreateWidget, but this forced all widgets inside the row to be shown, and is no longer the case. Applications should be updated to show the desired row widgets. T_item Base class of the items in the Gio::ListModel. All items must be of type T_item or a type derived from T_item. T_item must be Glib::Object or a type derived from Glib::Object. item The item from the model for which to create a widget. A Gtk::Widget that represents item. For instance: bool on_filter(ListBoxRow* row);. For instance, void on_foreach(ListBoxRow* row);. For instance: int on_sort(ListBoxRow* row1, ListBoxRow* row2);. For instance: void on_update_header(ListBoxRow* row, ListBoxRow* before);. Whenever row changes or which row is before row changes this is called, which lets you update the header on row. You may remove or set a new one via ListBoxRow::set_header() or just change the state of the current header widget. Append a widget to the list. If a sort function is set, the widget will actually be inserted at the calculated position and this function has the same effect of Gtk::Container::add(). child The Gtk::Widget to add. The contents of the ListBox are cleared and then filled with widgets that represent items from store. The ListBox is updated whenever store changes. If store is an empty Glib::RefPtr, the ListBox is left empty. It is undefined to add or remove widgets directly (for example, with insert() or Gtk::Container::add()) while the ListBox is bound to a model. Note that using a model is incompatible with the filtering and sorting functionality in ListBox. When using a model, filtering and sorting should be implemented by the model. T_item Base class of the items in the Gio::ListStore. All items must be of type T_item or a type derived from T_item. T_item must be Glib::Object or a type derived from Glib::Object. T_slot SlotCreateWidget<T_item> or a type that can be converted to SlotCreateWidget<T_item>. store The Gio::ListStore<> to be bound. slot_create_widget A slot that creates widgets for items. If this ListBox was already bound to a model, that previous binding is destroyed. The contents of the ListBox are cleared and then filled with widgets that represent items from model. The ListBox is updated whenever model changes. If model is an empty Glib::RefPtr, the ListBox is left empty. model The Gio::ListModel to be bound. This is a helper function for implementing DnD onto a Gtk::ListBox. The passed in row will be highlighted via gtk_drag_highlight(), and any previously highlighted row will be unhighlighted. If a row has previously been highlighted via drag_highlight_row() it will have the highlight removed. true if rows are activated on single click, false otherwise. If _index is negative or larger than the number of items in the list, nullptr is returned. index The index of the row. The child Gtk::Widget or nullptr. The row or nullptr in case no row exists for the given y coordinate. Note that the box may allow multiple selection, in which case you should use selected_foreach() to find all selected rows. 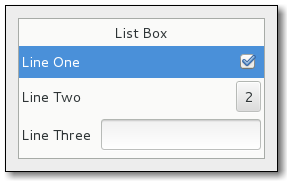 A List containing the Gtk::Widget for each selected child. Insert the child into the box at position. position The position to insert child in. Call this when result of the filter function on the box is changed due to an external factor. For instance, this would be used if the filter function just looked for a specific search string and the entry with the search string has changed. Call this when result of the header function on the box is changed due to an external factor. Call this when result of the sort function on the box is changed due to an external factor. This is a default handler for the signal signal_row_activated(). This is a default handler for the signal signal_row_selected(). row The row to select or nullptr. For instance, this is used to get the page size for PageUp/Down key handling. In the normal case when the box is packed inside a Gtk::ScrolledWindow the adjustment from that will be picked up automatically, so there is no need to manually do that. adjustment The adjustment, or nullptr. By setting a filter function on the ListBox one can decide dynamically which of the rows to show. For instance, to implement a search function on a list that filters the original list to only show the matching rows. The slot will be called for each row after the call, and it will continue to be called each time a row changes (via ListBoxRow::changed()) or when invalidate_filter() is called. By setting a header function on the ListBox one can dynamically add headers in front of rows, depending on the contents of the row and its position in the list. For instance, one could use it to add headers in front of the first item of a new kind, in a list sorted by the kind. The slot can look at the current header widget using ListBoxRow::get_header() and either update the state of the widget as needed, or set a new one using ListBoxRow::set_header(). If no header is needed, use ListBoxRow::unset_header(). Note that you may get many calls to this slot for a particular row when e.g. changing things that don't affect the header. In this case it is important for performance to not blindly replace an exisiting header with an identical one. The slot function will be called for each row after the call, and it will continue to be called each time a row changes (via ListBoxRow::changed()) and when the row before changes (either by ListBoxRow::changed() on the previous row, or when the previous row becomes a different row). It is also called for all rows when invalidate_headers() is called. placeholder A Gtk::Widget or nullptr. By setting a sort function on the ListBox one can dynamically reorder the rows of the list, based on the contents of the rows. The slot will be called for each row after the call, and will continue to be called each time a row changes (via ListBoxRow::changed()) and when invalidate_sort() is called. The signal_row_activated() signal is emitted when a row has been activated by the user. The signal_row_selected() signal is emitted when a new row is selected, or (with a nullptr row) when the selection is cleared. When the box is using Gtk::SELECTION_MULTIPLE, this signal will not give you the full picture of selection changes, and you should use the Gtk::ListBox::signal_selected_rows_changed() signal instead. The signal_selected_rows_changed() signal is emitted when the set of selected rows changes. Unselects the currently selected row, if any. row The row to unselected. Removes the filter function, if any. Removes the header function, if any. Removes the placeholder widget, if any. Removes the sort function, if any.